The Black Swift is the largest of the swift species north of Mexico but the least studied. This species nests exclusively on ledges or shallow caves on steep rock faces behind waterfalls and is unique among swifts in laying only one egg per clutch (Lowther and Collins 2002). They are over 7 inches in length and have wingspans up to 18 inches. As the name implies, Black Swifts are completely dark in appearance. A distinctly notched tail on the adult male is the only difference in appearance between the sexes. They have long, broad-based, and curved wings, similar to hummingbirds. The tail is square and often fanned. Juveniles are similar in appearance to adults, except for the small bands of white present across much of the underbody (neck, belly, and undertail coverts). The wingbeats are slow and shallow, often looking erratic in flight when foraging (Sibley 2014). The coloration of Black Swifts distinguishes them from White-throated Swifts (Aeronautes saxatalis), which have broad white markings on the chin, neck, breast, and sides of the rump. Black Swifts are much larger, have longer tails and are darker than Vaux's Swift (Chaetura vauxi). The same is true in comparison to Chimney Swifts (Chaetura pelagica), which also barely overlaps in range with Black Swifts. 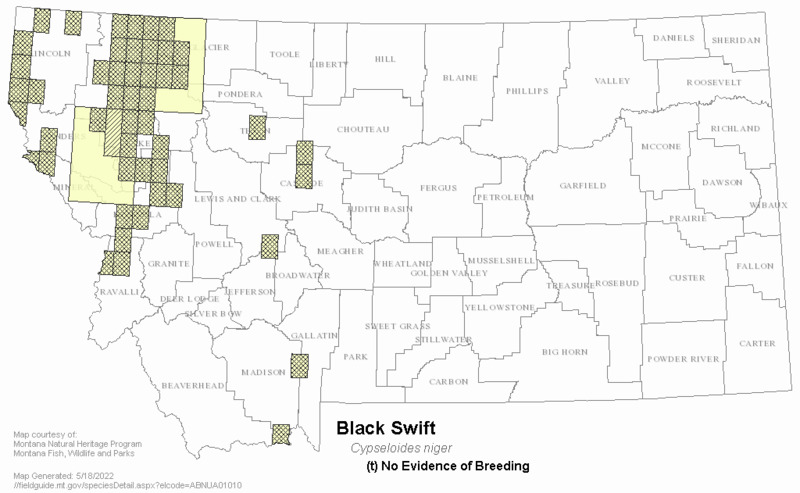 Little information regarding the migratory patterns of Black Swifts exists for Montana. Birds have been observed in migration as early as May and as late as August (Montana Bird Distribution Committee 2012). All observations of migration or transitory behavior have occurred in the western part of the state, usually in areas where mountainous habitat exists including the Lolo Peak area in Missoula County, Lee Metcalf National Wildlife Refuge, and the National Bison Range (Montana Bird Distribution Committee 2012). Like other swifts, Black Swifts forage over open areas often over bodies of water, often at long distances from the nest (Collins and Peterson 1998). They nest behind or next to waterfalls on steep cliff faces (Lowther and Collins 2002). Nesting locations share the following characteristics: water, high relief, inaccessibility to predators, unobstructed flyways to and from the nest, and darkness (Lowther and Collins 2002). Black Swifts feed on flying insects and arthropods, particularly winged ants. Swifts forage in the air, often at great heights, particularly in good weather. Apparently concentrate along low pressure weather systems, which may also concentrate aerial insects (Lowther and Collins 2002). Suitable nest sites are limited; birds nest singly or semicolonially depending on availability of sites (Lowther and Collins 2002). The Black Swift has strong fidelity to nest sites, and new nests may be built directly atop previously used nests (Lowther and Collins 2002). The nest is a cup composed of mud, mosses and liverworts, pine needles, and twigs (Hunter and Baldwin 1962). A single egg is laid in June to July. Both parents visit the nest throughout the breeding season, but the division of incubation and brooding duties is unknown. The incubation period is long, at 26 days (range 22-32 days). The nestling phase averages 48 days (range 40-58 days; Gunn et al. 2012). Once fledged, it is assumed that young migrate with adults (Lowther and Collins 2002). 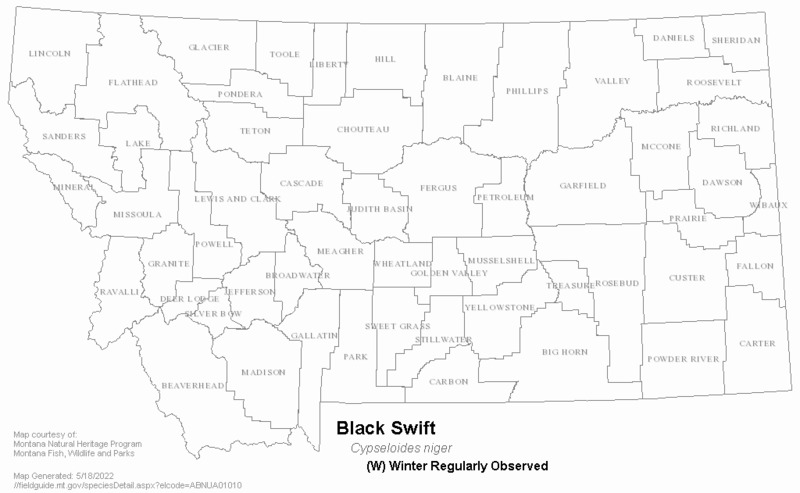 No active management currently is in place for Black Swifts in Montana, although decreases in water flow and increased recreational use in areas where Black Swifts nest, or are thought to nest, should be discouraged (Casey 2000). Additionally, reduced snow packs and earlier spring thaw and runoff could reduce stream flows. Collins, C.T. and B.M. Peterson. 1998. Nocturnal chick provisioning by black swifts. Western Birds 29:227-228. Davis, D. G. 1964. Black swifts nesting in a limestone cave in Colorado. Wilson Bulletin 76:295-296. Foerster, K. S. and C. T. Collins. 1990. Breeding distribution of the black swift in southern California. Western Birds 21:1-9. Gunn, C., K.M. Potter, and J.P. Beason. 2012. Nest microclimate at northern black swift colonies in Colorado, New Mexico, and California: temperature and relative humidity. Wilson Journal of Ornithology 124:797-802. Hunter, W. F. and P. H. Baldwin. 1962. Nesting of the black swift in Montana. Wilson Bulletin 74(4):409-416. Knorr, O. A. 1961. The geographical and ecological distribution of the black swift in Colorado. Wilson Bulletin 73(2):155-170. Knorr, O. A. and M. S. Knorr. 1989. The black swift in the Chiricahua Mountains of Arizona. Southwest Naturalist 35:559-560. Legg, K. 1956. A sea-cliff nest of the black swift. Condor 58:183-187. Lowther, P. E., and C. T. Collins. 2002. Black Swift (Cypseloides niger). In The birds of North America, No. 676 (A. Poole and F. Gill, Eds.). Academy of Natural Sciences of Philadelphia and American Ornithologists’ Union. Michael, C. M. 1927. Black swift nesting in Yosemite National Park. Condor 29:89-97. Vrooman, A. G. 1901. Discovery of the egg of the black swift (Cypseloides niger borealis). Auk 18:394-395. Altman, B. 2003. Inventorying Black Swift nesting populations at waterfalls in the Northern Pacific Rainforest Bird Conservation Region. American Bird Conservancy, Corvallis, OR. Casey, D. 2004. Coordinated bird monitoring in Montana. Special species monitoring: Black Swift. Prepared for the Montana Bird Conservation Partnership and the University of Montana. American Bird Conservancy, Kalispell, MT..
Colorado Partners in Flight. 2000. Physiographic Region 62: Southern Rocky Mountains. Hunter, W.F. and P.H. Baldwin. 1972. Black swift nest in Glacier National Park. The Murrelet 53(3):50-51. Johnson, P.W. 1990. Black swift (Cypseloides niger) nesting in the Jemez Mountains of New Mexico. New Mexico Ornithological Society Bulletin. 18:13-15. Knorr, O. A. 1993. 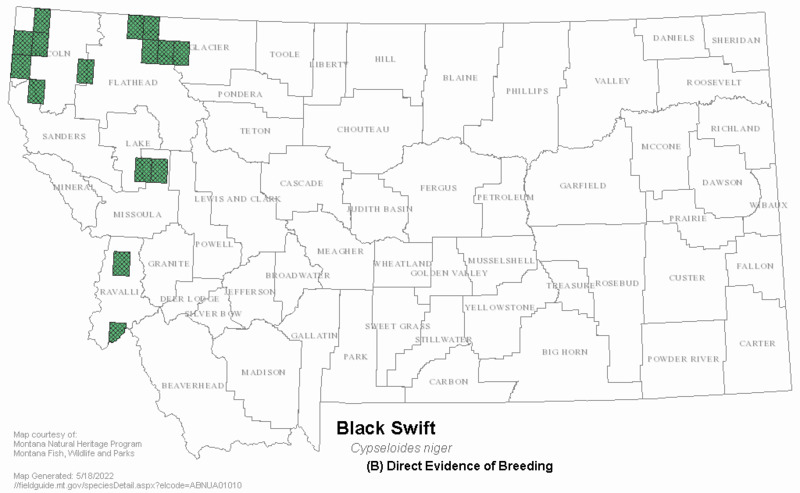 Breeding of the Black Swift in the Great Basin. West. Birds 24(3): 197-198. Knorr, O. A. 1993. 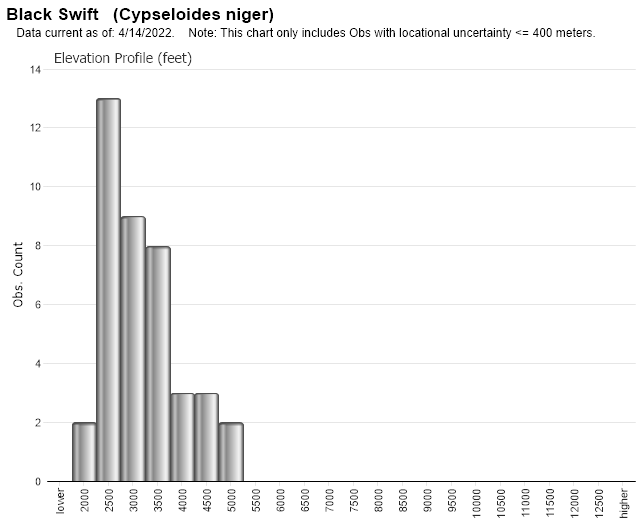 Black Swift (Cypseloides niger) nesting site characteristics: Some new insights. Avocetta 17:139-140. Levad, R.G., K.M. Potter, C.W. Shultz, C. Gunn, and J.G Doerr. 2008. Distribution, abundance, and nest-site characteristics of black swifts in the Southern Rocky Mountains of Colorado and New Mexico. Wilson Journal of Ornithology 120(2):331-338. Marín, M. 1997. Some aspects of the breeding biology of the Black Swift. Wilson Bulletin 109:290-306. Schultz, C., and R. Levad. 2002. Black Swift survey protocol. San Juan National Forest and Rocky Mountain Bird Observatory, Grand Junction, CO.
Stiles, F.G. and A.J. Negret. 1994. The nonbreeding distribution of the Black Swift: A clue from Colombia and unsolved problems. The Condor 96(4): 1091-1094. Weydemeyer, W. 1932. The Black Swift in Glacier National Park. Condor 34:100. Web Search Engines for Articles on "Black Swift"